Born in Boston, and surrounded by the fenland landscape of Lincolnshire, Diane grew up with a fascination for mountains. Diane began her career as a Graphic Designer, until an increasing demand for her watercolours led to a change in direction, whilst an insatiable love of the Lake District resulted in the inevitable move to Cumbria in 1995. Diane now enjoys working from her studio in the Eden Valley. 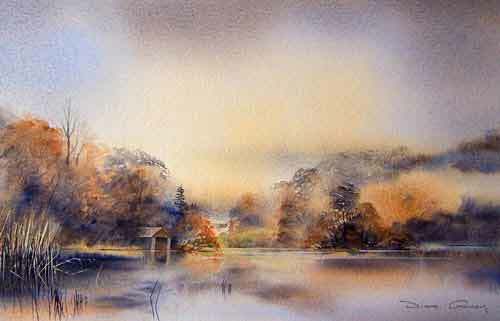 Her fascination for atmosphere is intense, as is her desire to capture these illusive images with the transparency and sensitivity of watercolour. As a self published artist, Diane has produced an extensive range of Limited Edition prints, and greeting cards, in addition to her original paintings. Diane owns and runs Viridian Gallery, in Keswick, whilst also exhibiting in many galleries throughout the country, and Scotland.